The most notable feature in Hindu religious ritual is the division between purity and pollution. Religious acts presuppose some degree of impurity or defilement for the practitioner, which must be overcome or neutralized before or during ritual procedures. Purification, usually with water, is thus a typical feature of most religious actions. 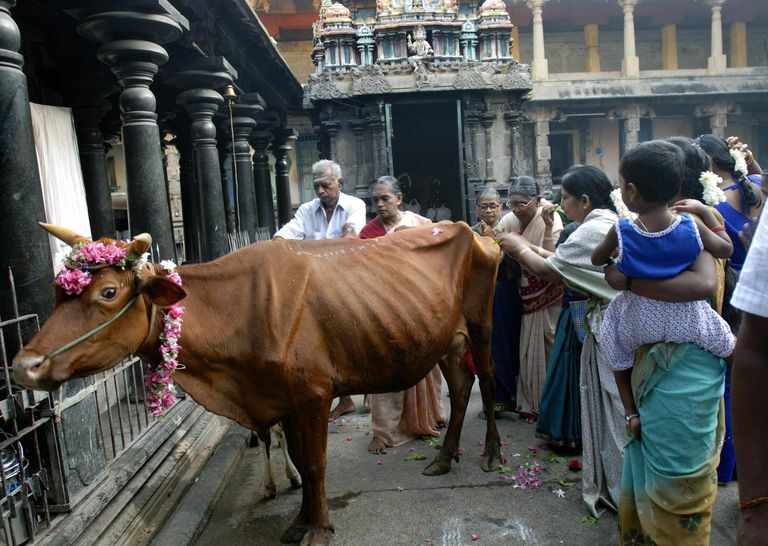 Avoidance of the impure—taking animal life, eating flesh, associating with dead things, or body fluids—is another feature of Hindu ritual and is important for repressing pollution. In a social context, those individuals or groups who manage to avoid the impure are accorded increased respect. Still, another feature is a belief in the efficacy of sacrifice, including survivals of Vedic sacrifice. Thus, sacrifices may include the performance of offerings in a regulated manner, with the preparation of sacred space, recitation of texts, and the manipulation of objects. A third feature is the concept of merit, gained through the performance of charity or good works, that will accumulate over time and reduce sufferings in the next world. The home is the place where most Hindus conduct their worship and religious rituals. The most important times of day for the performance of household rituals are dawn and dusk, although especially devout families may engage in devotion more often. For many households, the day begins when the women in the house draw auspicious geometric designs in chalk or rice flour on the floor or the doorstep. For orthodox Hindus, dawn and dusk are greeted with recitation from the Rig Veda of the Gayatri Mantra for the sun—for many people, the only Sanskrit prayer they know. After the ritual purification of a bath, the Hindu family conducts personal worship of the gods at their shrine, which typically includes lighting a lamp and offering foodstuffs before the images, while prayers in Sanskrit or a regional language are recited. In the evenings, especially in rural areas, mostly female devotees may gather together for long sessions of singing hymns in praise of one or more of the gods. For the vast majority of Hindus, the most important religious path is bhakti (devotion) to personal gods. There is a wide variety of gods to choose from, and although sectarian adherence to particular deities is often strong, there is a widespread acceptance of choice in the desired god (ishta devata) as the most appropriate focus for any particular person. Most devotees are therefore polytheists, worshiping all or part of the vast pantheon of deities, some of whom have come down from Vedic times. In practice, a worshiper tends to concentrate prayers on one deity or on a small group of deities with whom there is a close personal relationship. Puja (worship) of the gods consists of a range of ritual offerings and prayers typically performed either daily or on special days before an image of the deity, which may be in the form of a person or a symbol of the sacred presence. In its more developed forms, puja consists of a series of ritual stages beginning with personal purification and invocation of the god, followed by offerings of flowers, food, or other objects such as clothing, accompanied by fervent prayers. Some dedicated worshipers perform these ceremonies daily at their home shrines; others travel to one or more temples to perform puja, alone or with the aid of temple priests who receive offerings and present these offerings to the gods. The gifts given to the gods become sacred through contact with their images or with their shrines and may be received and used by worshipers as the grace (prasada) of the divine. Sacred ash or saffron powder, for example, is often distributed after puja and smeared on the foreheads of devotees. In the absence of any of these ritual objects, however, puja may take the form of a simple prayer sent toward the image of the divine, and it is common to see people stop for a moment at roadside shrines to fold their hands and offer short invocations to the gods. Since at least the seventh century CE, the devotional path has spread from the south throughout India through the literary and musical activities of saints who have been some of the most important representatives of regional languages and traditions. The hymns of these saints and their successors, mostly in vernacular forms, are memorized and performed at all levels of society. Every state in India has its own bhakti tradition and poets who are studied and revered. In Tamil Nadu, groups called Nayanmars (devotees of Shiva) and Alvars (devotees of Vishnu) were composing beautiful poetry in the Tamil language as early as the sixth century. In Bengal one of the greatest poets was Chaitanya (1485–1536), who spent much of his life in a state of mystical ecstasy. One of the greatest North Indian saints was Kabir (ca. 1440–1518), a common leatherworker who stressed faith in God without devotion to images, rituals, or scriptures. Among female poets, Princess Mirabai (ca. 1498–1546) from Rajasthan stands out as one whose love for Krishna was so intense that she suffered persecution for her public singing and dancing for the lord. A recurring motif that emerges from the poetry and the hagiographies of these saints is the equality of all men and women before God and the ability of people from all castes and occupations to find their way to union with God if they have enough faith and devotion. In this sense, the bhakti tradition serves as one of the equalizing forces in Indian society and culture. A detailed series of life-cycle rituals (samskara, or refinements) mark major transitions in the life of the individual. Especially orthodox Hindu families may invite Brahman priests to their homes to officiate at these rituals, complete with sacred fire and recitations of mantras. Most of these rituals, however, do not occur in the presence of such priests, and among many groups who do not revere the Vedas or respect Brahmans, there may be other officiants or variations in the rites. Ceremonies may be performed during pregnancy to ensure the health of the mother and growing child. The father may part the hair of the mother three times upward from the front to the back, to assure the ripening of the embryo. Charms may serve to ward off the evil eye and witches or demons. At birth, before the umbilical cord is severed, the father may touch the baby's lips with a gold spoon or ring dipped in honey, curds, and ghee. The word vak (speech) is whispered three times into the right ear, and mantras are chanted to ensure a long life. A number of rituals for the infant include the first visit outside to a temple, the first feeding with solid food (usually cooked rice), an ear-piercing ceremony, and the first haircut (shaving the head) that often occurs at a temple or during a festival when the cut hair is offered to a deity. A crucial event in the life of the orthodox, upper-caste Hindu male is an initiation (upanayana) ceremony, which takes place for some young males between the ages of six and twelve to mark the transition to awareness and adult religious responsibilities. 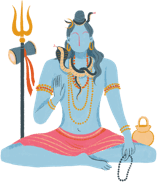 At the ceremony itself, the family priest invests the boy with a sacred thread to be worn always over the left shoulder, and the parents instruct him in pronouncing the Gayatri Mantra. The initiation ceremony is seen as a new birth; those groups entitled to wear the sacred thread are called the twice-born. In the ancient categorization of society associated with the Vedas, only the three highest groups—Brahman, warrior (Kshatriya), and commoner or merchant (Vaishya)—were allowed to wear the thread, to make them distinct from the fourth group of servants (Shudra). Many individuals and groups who have only hazily associated with the old "twice-born" elites perform the upanayana ceremony and claim the higher status it bestows. For young Hindu women in South India, a different ritual and celebration occur at the first menses. The next important transition in life is marriage. For most people in India, the betrothal of the young couple and the exact date and time of the wedding are matters decided by the parents in consultation with astrologers. At Hindu weddings, the bride and bridegroom represent the god and the goddess, although there is a parallel tradition that sees the groom as a prince coming to wed his princess. The groom, decked in all his finery, often travels to the wedding site on a caparisoned white horse or in an open limousine, accompanied by a procession of relatives, musicians, and bearers of ornate electrified lamps. The actual ceremonies in many cases become extremely elaborate, but orthodox Hindu marriages typically have at their center the recitation of mantras by priests. In a crucial rite, the new couple takes seven steps northward from a sacred household fire, turn, and make offerings into the flames. Independent traditions in regional languages and among different caste groups support wide variations in ritual. After the death of a family member, the relatives become involved in ceremonies for the preparation of the body and a procession to the burning or burial ground. For most Hindus, cremation is the ideal method for dealing with the dead, although many groups practice burial instead; infants are buried rather than cremated. At the funeral site, in the presence of the male mourners, the closest relative of the deceased (usually the eldest son) takes charge of the final rite and, if it is cremation, lights the funeral pyre. After a cremation, ashes, and fragments of bone are collected and eventually immersed in a holy river. After a funeral, everyone undergoes a purifying bath. The immediate family remains in a state of intense pollution for a set number of days (sometimes ten, eleven, or thirteen). At the end of that period, close family members meet for a ceremonial meal and often give gifts to the poor or to charities. A particular feature of the Hindu ritual is the preparation of rice balls (pinda) offered to the spirit of the dead person during memorial services. In part, these ceremonies are seen as contributing to the merit of the deceased, but they also pacify the soul so that it will not linger in this world as a ghost but will pass through the realm of Yama, the god of death.